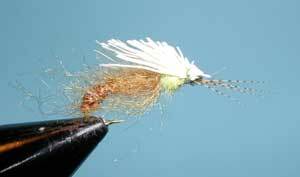 Notes: This Nymph pattern was developed by Jim Pettis, a guide on the lower Sacramento River, in 1993. The fly can be used in both streams and stillwaters. 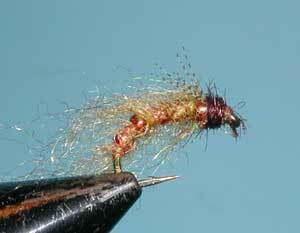 It was intended to represent Hydropsyche caddis which are prominent in the Lower Sac. Most popular colors are root beer and medium olive. The term 'pulsating' comes from the combination of the beads and the dubbing material which give off a pulsating effect when moving within the water column. 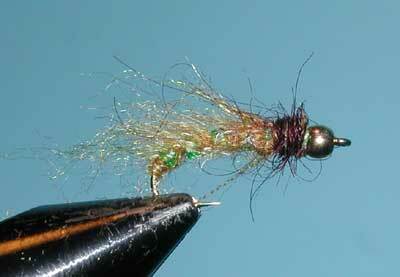 Jim ties this pattern as a pupa, pupa bead-head , and emerger. Generally, he fishes this on the bottom as a beadhead pupa in the early morning, mid water in the afternoon as a pupa pattern, and a surface emerger in the evening. The fly can be used throughout the season from April through October.